With rumors claiming the iPhone 6 will include a near field communications (NFC) chip from NXP to potentially support a mobile payments initiative from Apple flying in recent days, the existence of the chip now appears to have been confirmed. 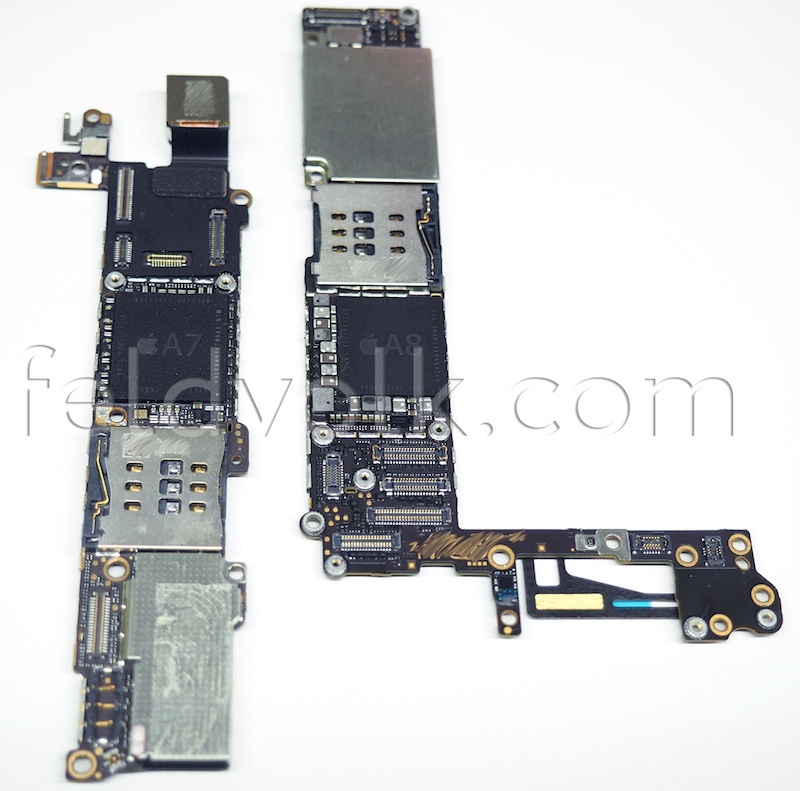 Luxury modified iPhone vendor Feld & Volk [Instagram page], which has shared a number of claimed parts from the iPhone 6 in recent weeks, has now gotten its hands on a complete logic board for the device. 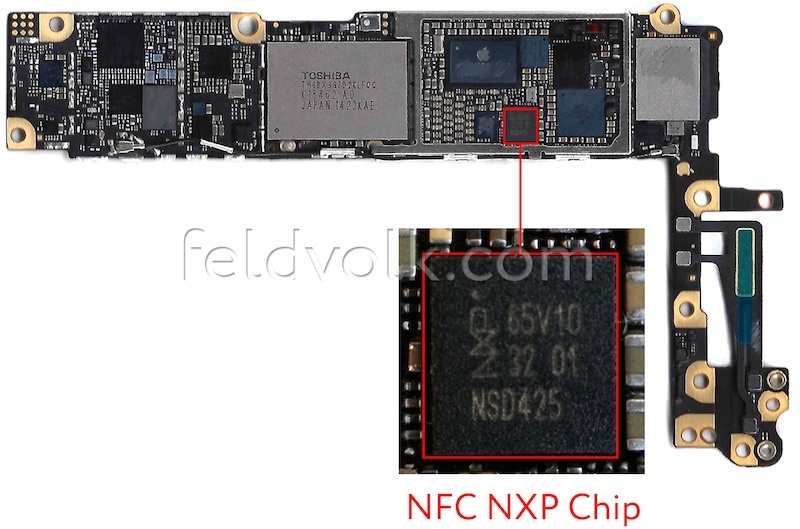 The firm has shared a few photos of the logic board with Sonny Dickson, revealing the board's NFC chip from NXP. Apple has confirmed that it will be holding a media event at the Flint Center for the Performing Arts in Cupertino on September 9, and the company is naturally expected to introduce the iPhone 6 at the event with a launch coming shortly after. Apple is also said to be showing off its wearable device, commonly referred to as the iWatch, although it is unclear when that device will be available for sale. Android - you better thank Apple for this...NFC will finally take off! Screw payment system, I want my front door lock to be NFC and my car so i can open my house with my phone and my fingerprint. I ideally want to leave my keys and wallet at home. phone and headphones. thats all you need. OK, the iPhone 6 will get NFC. We get it. What if it can only communicate with the iwatch and not for mobile payments! 1) NFC payments are here and will be accelerating, with or without Apple. Not supporting them would be like leaving out Bluetooth. PS. If these guys have a board, then they should give it to someone with the ability to X-Ray or de-cap the chips and figure out the amount of RAM, etc. Nothing is confirmed until Apple unveil the iPhone 6 on stage. Hey thanks, I'm pretty sure you're right, but do you have a source for this? I highly doubt nfc payments are exploding all over the world and not the US. There are few facts about NFC that many people do not know. The technology is intended for micro payments, like paying for vending machines and bus stations. The type of payments that banks can cover fraudulent actions and so they do not have to invest money in security and this is a fact about NFC that it does not have any security protection apart from the fact that you really need to come very close from the card or to actually touch it. You can find many videos on the Internet for people who come close to NFC enabled card holders and read their information as a proof for that. NFC readers are available in so many places , even in USA, but people simply do not know about them. Apple have requested a patent for a touch ID enabled NFC integration where they will address the security part. Your card information will be saved in the secure enclave of the CPU which is not accessible by any system except the touch Id sensor and for payment you have to authenticate on the sensor to authorize the payment. As usual from apple an elegant and simple solution which will explode the use of NFC. Other companies have the NFC chip for years on the phones as a feature on the list of many unused features list but never provided a secure solution that is simple for users to use. This is why I like apple. They do not go into feature wars like other companies and provide half baked features that is not used after 5 minutes from buying the phone. They work hard to make completed features secure and simple for the normal user. I have never seen anyone use NFC and know of very few places in the UK that even bother to implement it. Exactly! Lol! Just because every major Android phone had NFC doesn't mean it was going well. The RAM part numbers on the A8 start with H9CKNNN... which is Hynix LPDDR3. So no LPDDR4. The A7 die they show begin with the same numbers. The next digit after the N determines the capacity with 8 being 1 GB (ie. H9CKNNN8) and B being 2 GB (H9CKNNNB). Sadly the image isn't high enough to make it out. Why this coming year and not last year or the year before? NFC has been in Samsung phones since the S3 (released in 2012) and Visa and Samsung have teamed up in 2013 to accelerate the boosting of NFC. It's coming because Visa, Mastercard, Discover, AMEX and others are forcing the issue. Most of them have a deadline in the US of EMV adoption by October 2015. After that, merchants become liable for fraudulent card purchases. The rest of the civilized world has already moved to EMV. In those countries, credit card fraud has dropped up to 90%... which has caused criminals to move their fraud operations to the US instead. Again, though, I don't think this will result in any huge move to constant mobile payments. Not for a while. But people will want the option. Here in the U.S., I've never even heard of NFC. Only stories from MacRumors. I also can't see Apple pushing adoption much. For all that hype, iBeacon hasn't taken off at all either. Have you seen this logo on your Visa card? Or this one on your Mastercard? Check gas stations, check out payment kiosks at your local grocers. Often you can tap to pay, and that's NFC. What few people have done is advertise the hell out of wave-to-pay. But it's actually quite common. I guess what people want is for Apple to herald it's coming and then everyone can give credit to Apple for bringing it to the mainstream. But no, it was all there, embedded. People just weren't aware.